Karolinska Institutet Solna Campus has undergone dramatic changes, peaking with the move from the old buildings into Biomedicum during the spring of 2018. 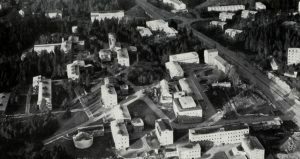 The architecture of our original Campus was formed according to the prize winning plan of Ture Ryberg named “Per Haps” in 1937. The construction of the original Department buildings took place during 1938 – 1957. Since then the Campus has been rebuilt with new buildings three times. Wikiki is a project initiated to take care of the history of this phase of our Campus 1940’s until today. The project has been launched by some of the researchers that moved into to the new Biomedicum building in April 2018. We will assist in taking care of historical items, documentation, photographs and movies with some future value re these 70 years. We will also ask colleagues to write essays about the different successful research environments and scientists and other staff that have been active at our campus. We will use a home page WikiKI.se to collect those histories, documentation and photographs.